Put my TN on someone else’s phone: This will enable users to receive calls placed to another user’s Extension (from their own phone), to place calls from another user’s Extension (from their own phone), and to see the status of that extension from the Line Key on their own phone. An example of this is an Executive Assistant who wants to be able to make and receive calls from the boss’s line. Soft Client Use: To enable Users to download and use the Desktop and/or Mobile softclients. This article will provide instructions for setting up sharing services on physical phones as well as the desktop and mobile applications. Each phone can be shared on a maximum of 5 additional devices. The following topics will help you with common Sharing Configuration for User related questions. How do I configure sharing on a physical phone? How do I enable a User to download the mobile and/or desktop client? What are the feature limitations when multiple users are sharing the same telephone number and sharing a single seat? A. How do I configure sharing on a physical phone? Select the site from the list on the lest. The My Site dashboard appears displaying quick links. Go to the Share a Line quick link. Select the User and click Edit. For example, if Sylvia wants to be able to place and receive calls from JoAnne’s line, you would select JoAnne’s phone number. The system will display all of the devices on that site to which the number can be shared. Check the “Shared” Checkbox for each row to which you want sharing to be applied, and then select “Save”. Alert all appearances for Group Paging Calls – This will ring all devices/soft clients when a Group Page has been initiated. For more information on Group Page, please see the Group Paging article. Enable Call Park Notification – This will allow the devices/soft clients to receive a notification when a call has been parked on their line. For more information of Call Park, please see the Call Park and Call Pickup article. B. How do I enable a User to download the mobile and/or desktop client? Select the User you would like to set up and click Edit. The Sharing Configuration window will appear. Select the Soft Client endpoint type. Check the Shared box next to the soft client application you would like to enable for the User to download. Once the Soft Clients have been shared, the user will see them in Mobile App and Desktop Softphone area of the My Phone portal. The User’s ID will be displayed from My Phone, and the Password is the same Password used to log in to My Phone. C. What are the feature limitations when multiple users are sharing the same telephone number and sharing a single seat? Yes. Many of the features are designed to be used when people have been assigned their own unique phone number and/or have been assigned their own seat package. Intercom (Push to Talk): A full phone number or unique seat package is required. Displaying multiple user’s lines on a single phone: This can only be set up on the phone that the telephone number is physically assigned to. Other phone that ring will not display multiple lines. 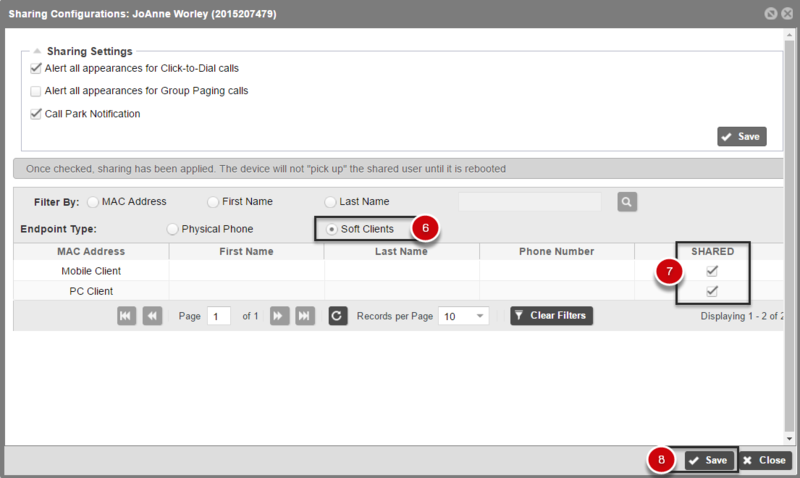 Receive call transfers: A full telephone number or unique seat package is required to transfer calls from one phone to another. Voicemail: This feature is only available on the phone that the telephone number has been assigned to. For other users sharing that number to have their own voicemail box, an individual voicemail box must be purchased and calls can be sent to voicemail using the Auto Attendant Functionality. Hunting: This feature requires a minimum of two seat packages and/or unique telephone numbers. Receive calls directly: Users that do not have their own phone number or seat package cannot receive calls directly to their phone. NOTE: It is recommended that users are assigned a full telephone number and a unique seat package to maximize the value of the BDV service.